Snook season opened September 1st for the first time since the record cold snap of 2009. The west coast slot snook limit is one snook per person per day measured 28 inches to 33 inches from the tip of the bottom lip to the tip of the pinched tail down the lateral line of the fish. We did not catch a keeper snook the first week. We caught several under the slot and a few over the slot. On week two we caught one that was in the slot 32.5 inches and a few others outside the slot. Week three and four the snook bite picked up dramatically. October will be game on for snook, for three main reasons: Snook are in a pre-spawn feeding mode. Th is is the time of the year when snook will eat until their stomach’s are full and then try to feed some more. Like puppies!! Snook will feed like mad because they’ve been spawning in the hot water for weeks and now they’ve laid their eggs and the cooler October water turns their feeder button on. Snook have a tough time finding bait fish in the hot water during the summer, just like we do. Once the water temp starts falling into the high to mid 70′s the bait fish come pouring into the bay and the snook are ready and willing to harvest the crop. They make up for the lack of bait during the summer and gorge during fall to get fattened up for winter. Snook are not as plentiful as they were before the freeze of 2009, but they are making a good comeback. Opening snook season was met with much controversy. 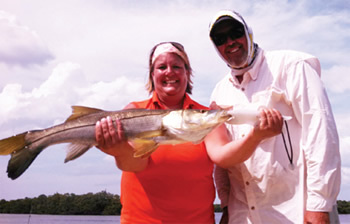 Th e majority of the captains and avid snook anglers felt like we were opening snook season a year or two to early. Several others felt like snook season should be opened and since it’s only one snook per person per day what can one snook being killed matter, plus if you’ve ever eaten fresh snook, you want some more. I’m on the fence about it. On one hand I agree with the captains and avid snook anglers because, snook are all born male and at 26 to 28 inches they turn female and start spawning making new snook every year, and every year the big snook make more and better babies. Hence the reason for the slot limit 28 inches to 33 inches gives the snook that turned female at 26 inches four years to lay eggs before they can be taken for table fare and if the snook makes it over 33 inches before it’s harvested by an angler or killed by a dolphin, shark, or goliath grouper, then it is likely to lay eggs until it’s well over 40 inches. Th e 34 inch snook and up will have the most healthy hatchlings and these fry have big big snook genes in them and have a better chance of growing up to be big big snook themselves. A 26 inch snook is almost seven years old. If the freeze happened in 2009 (4 years ago) that means that the snook that were hatched after 2009 are all mostly still male. Many feel like we shouldn’t keep any snook until the 2009/10 hatch at least have a chance to become female and spawn for a year or two. On the other hand, mother nature has a way of working things out. Plus, I hadn’t eaten snook since the freeze. I treated my clients who caught that first keeper 32.5 incher to a “hook n cook” at Hooks Bar and Grill located atLittle Harbor. I forgot how “dadgum” great those gals taste. Th at big snook fed all four of us and even had some left overs to take home. Hooks fried half of it with an awesome beer batter and the other half was grilled with some mouth watering Cajun seasoning complimented with thick French fries, deep fried chips, and fresh broccoli, salad and cole slaw.